Instagram announced this week that it will be adding some user controls aimed at keeping "Instagram a safe and positive place for self-expression". The platform celebrated 800 million users this month and renewed its commitment to anti-abuse measures. From now on, all users with public profiles will be able to choose who can comment on their photos. Under "settings" the "comment" option will allow users to set commenting abilities for either "everyone", "people you follow", "people you follow and your followers" or just your followers. This will be an especially useful tool for internet personalities with medium to large followings. For instance, if someone with a substantial audience wanted to only allow comments from people that they follow, the volume of harmful or abusive comments would drop off significantly. 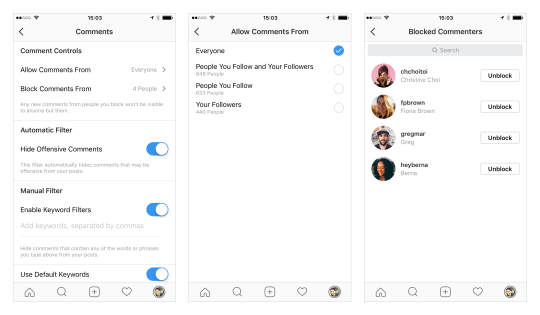 Earlier this year, Instagram began allowing all of its users to filter out harmful or abusive comments in just English. This week they have expanded the language filtering capabilities to include abusive or harmful comments in German, Portugues, French, and Arabic. Instagram's other filtering tools remain. Users can still turn off comments entirely for certain posts or filter out keywords that they don't wish to appear in their comment section. You can also block certain users from commenting under your posts. With 800 million active users on the platform, Instagram seems to be taking online harassment very seriously.